The Neighbor Complained Of A Constant Feeling Of Being Watched . . . 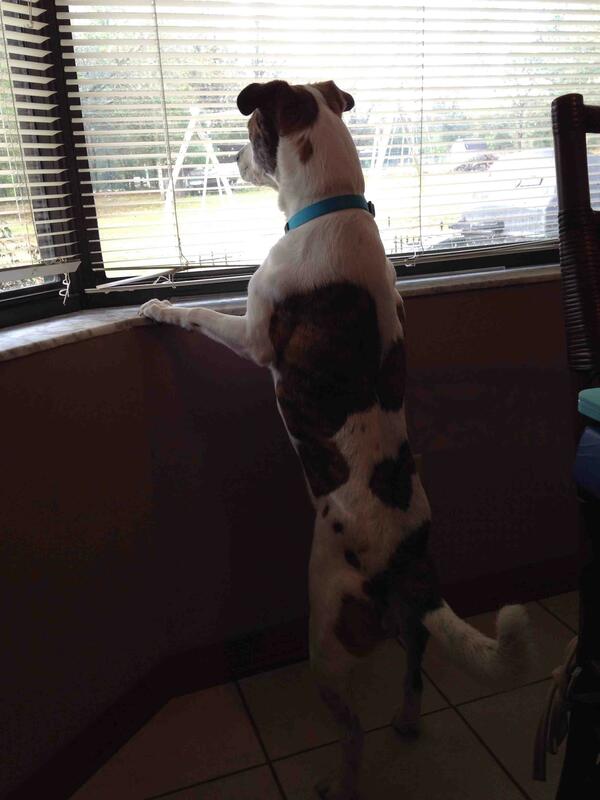 Dogs invented the concept of the neighborhood watch. Mailman, cat, cat mailman . . . it never gets old. Sounds like the complaining neighbor may have something to hide if he feels like he is being watched. Jjust a thought…….. Thank goodness for the posts in “Animals” – at least it makes me smile – everything else just makes my head explode. I like the mail trick with the postman…. Loyal dogs do act as watchdogs. Cats peer out the window and I sometimes suspect them as being lookouts. My 3 also work as undercover security at night…..
Watchdogs perform a valuable service, at no additional charge. Heh. My cat does the same thing from his kitty-condo by the window. I had one time driving on a two lane highway behind a pick-up truck with a dog in the bed. I followed the truck for about 8-10 miles. Every time a car would pass the dog would run over to the side and bark once at it. He would then run to the opposite side and stand looking around the cab. A car would come by and again one bark. If there was a line of cars he would stay at the side and bark once at each one in the line just as it passed. He was so dilligent about it he realized he missed one and ran to the tailgate for his bark. But, just to safe, he barked at it twice. Hah! That picture reminds me of our Yellow Lab who is constantly on duty at our front windows!